Antihormones are of substantial benefit in treating oestrogen receptor-α positive (ER+) breast cancer. However, their anti-tumour effect is limited by emergence of resistance. Our in vitro studies are highlighting a new underlying concept: that antihormones are not passive bystanders but alongside growth inhibitory effects promote adverse compensatory mechanisms within tumour cells. These mechanisms involve drug-induction of signalling elements normally suppressed by oestrogen (E2)-occupied E R˜ While best exemplified by the tyrosine kinases epidermal growth factor receptor and HER2, microarrays reveal the true diversity of the induced signalling kinases, where their potential to promote resistance is exacerbated under paracrine conditions. Such drug-induced events permit initial ER+ breast cancer cell survival, allow development and maintenance of resistance, and also promote gain of invasiveness under conditions of poor intercellular contact. In addition, prolonged antihormonal exposure is associated with epigenetic silencing of classical E2-induced tumour suppressors, an event which further contributes to resistance. 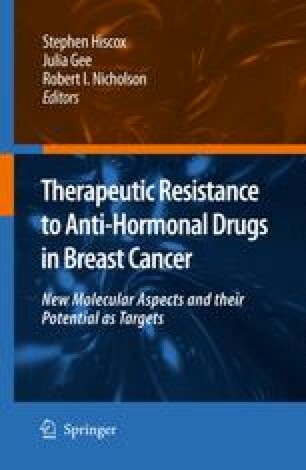 Based on proof of principle experiments targeting induced signalling events alongside antihormones or restoring E2-induced suppressor genes through DNA methylation inhibitor-containing strategies, it is our belief that continued deciphering of these mechanisms will reveal improved treatments for breast cancer.